As much fun as it can be to travel the planet aimlessly, this trip began with an objective. 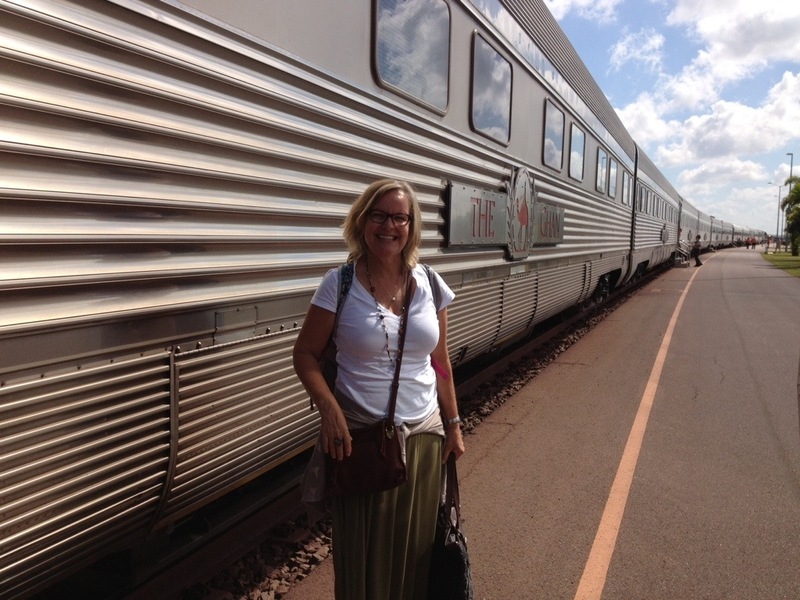 I wanted to experience one of the great train journeys of the world – The Ghan – through the Red Center of Australia. I have always loved train travel, the feeling of hurtling across the changing landscape, and the calm of being for a time out of touch. 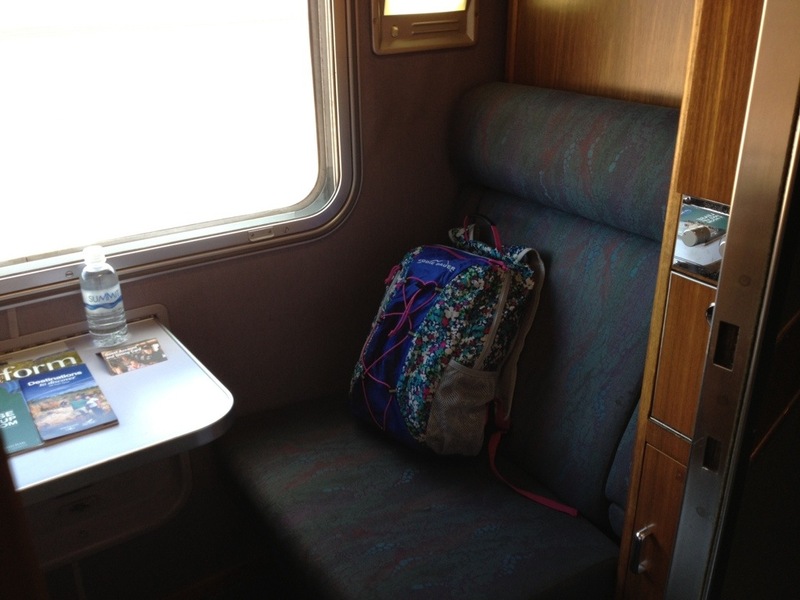 And traveling by train is a fabulous way to see a place, particularly for someone going solo in completely unforgiving territory. 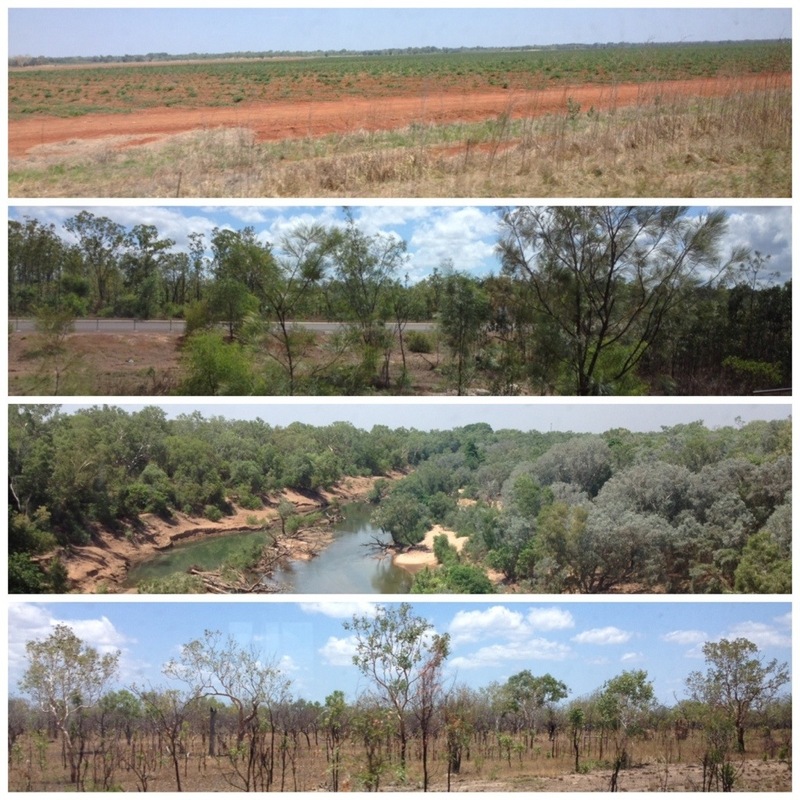 The Ghan is a shortened version of the name of the original red dirt track, that for a long time was the only way through the center of the country. Camels were imported by the hundreds to transport people and goods along this arduous route, as they were best suited to maneuvering the incredibly inhospitable terrain and withstanding the searing temperatures. Sometime after they started importing camels in the 1950’s the Aussies must have realized how little they knew about controlling them. So they imported hundreds of muslim camel drivers, who they referred to as Afghans, hence the name of the original trail and subsequently The Ghan. I cannot imagine the hardships and challenges of making this trek by camel but The Ghan was everything I hoped it would be. My tiny ‘stateroom’ was…well, perhaps not so much stately as tiny but it came nicely equipped with a comfy sofa, fold-down table for eating or writing, a night light and call button, a cleverly designed washstand (there’s no drain but the water runs out the back of the sink when you fold it up) and complimentary toiletries. 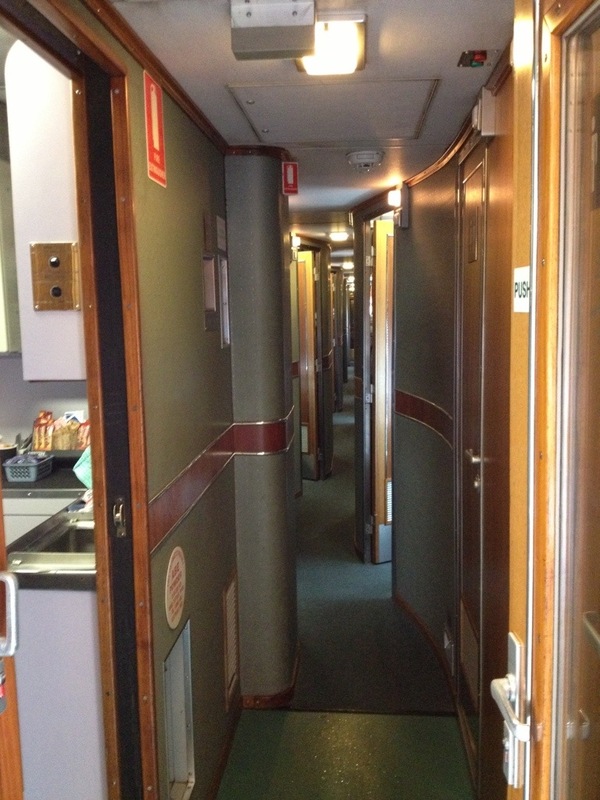 I was adopted almost immediately after boarding by ‘Fee’ (Felicity) in the stateroom across the narrow aisle from mine. She was traveling with long-time friends, Chris and Carol (“Just remember us like Christmas carol!”) and I was invited to be their fourth for meals. 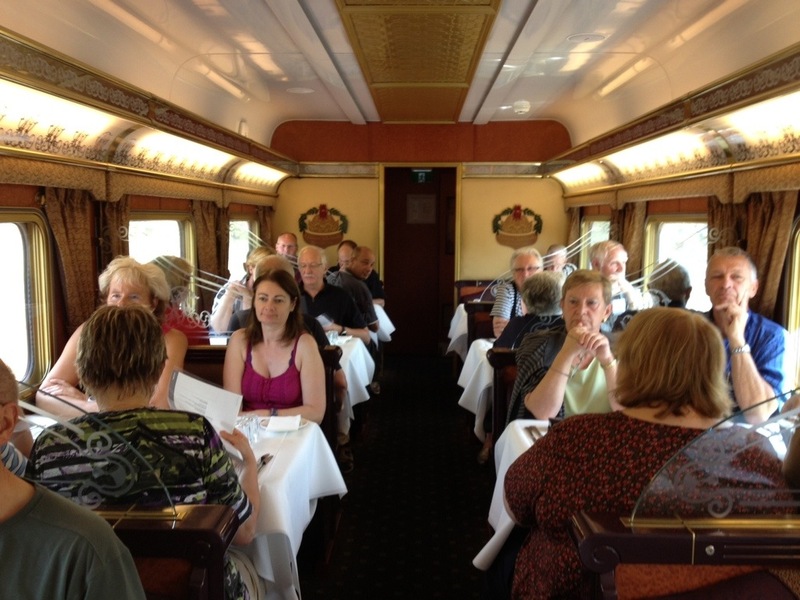 Meals are scheduled on the train so all 33 cars – 730 meters of train – can be served in an orderly way. I was happy for their company. Lunch was put on shortly after boarding and then, around mid-afternoon we made a stop in Katherine. 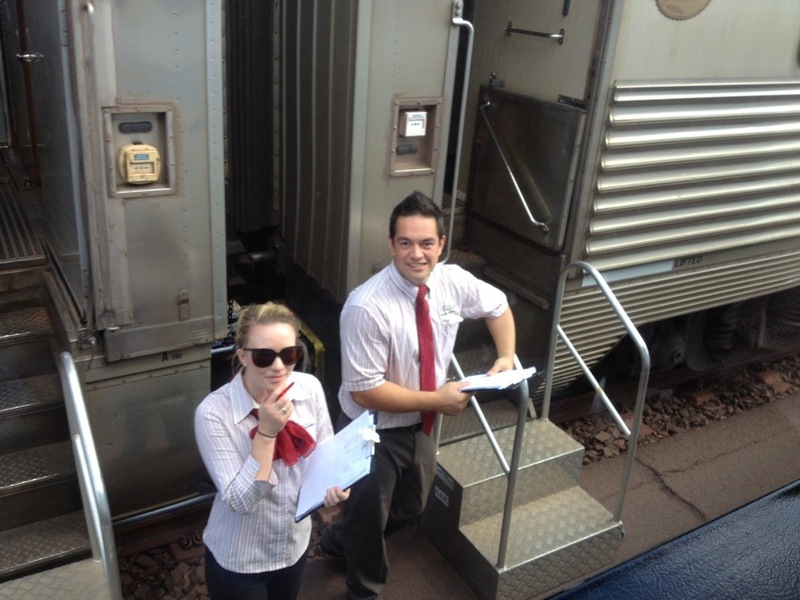 The Ghan offers a variety of ‘whistle stop’ tours and activities that in Katherine included a scenic flight, a boat cruise of Nitmiluk Gorge, and a Top ‘Didj’ (End) cultural experience. By then I was in need of a break from touring so with a vision of white picket fences, rolling lawns, and gin and tonics served on the veranda by white-jacketed waiters I chose the ‘Afternoon at the Katherine Country Club’. 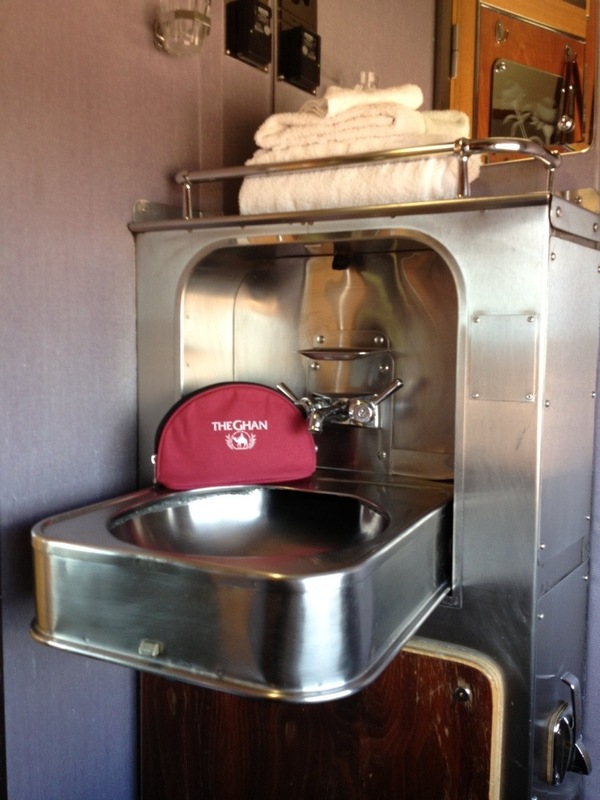 I thought I might even be able to get a spa treatment…maybe a massage. I realize now that the term ‘country club’ can be a relative thing. 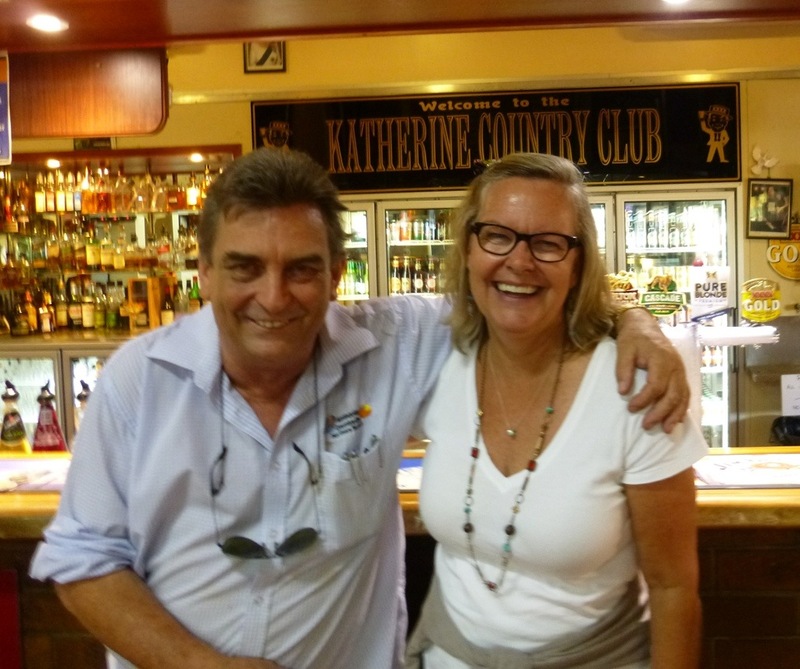 Here I am getting my ‘welcome to the Club!’ hug from the Commodore of the Katherine Country Club. Although not quite what I expected, I did manage to get the bartender to rustle up a round of G and T’s and proceeded to have a marvelous afternoon with Eddy, Biv and Rawjah (Beverly and Roger) talking politics, watching Aussie rules football on one of the many TV screens, horse racing on another, and the Aussie golf tour on another. A very satisfying afternoon. 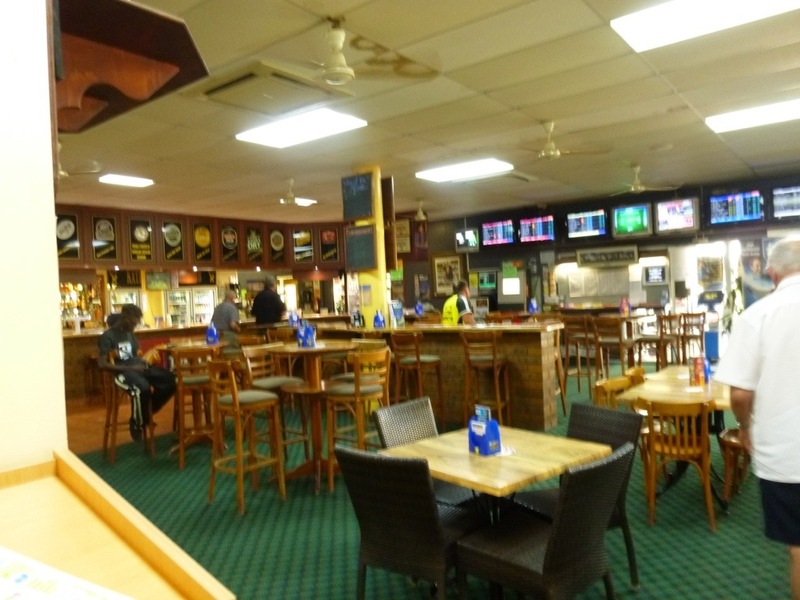 I was also given the opportunity to join the Katherine Country Club and, with the not-unreasonable expectation that they might have a reciprocal agreement with another club (maybe Augusta?) I signed up. This is not as frivolous a thought as you might think. There is a barely playable golf course in a very primitive outback outpost called Coober Pedy. It’s an area famous for mining opals but they are also known for playing golf at night with glow-in-the-dark balls because it’s just too hot to golf during the day. More interestingly though, they have a reciprocal agreement with St. Andrews! Yes, that St. Andrews. It was almost enough to make me want to go to Coober Pedy and sign up then and there, except that it would be a hot and grueling five hundred kilometer drive from Alice Springs over mostly dirt roads. Too bad. Now that I was a member I would have liked to play a round at my club but as the temperature in Katherine was forty-two degrees. I gave it a pass. 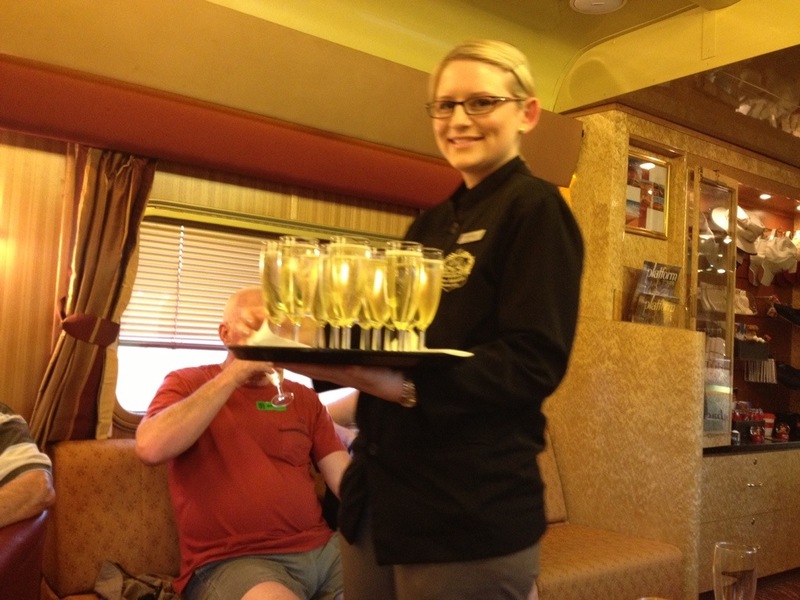 Back on board we had time for a glass of complimentary champagne before dinner. In a stroke of remarkable good fortune, my new friend Chris splashed part of a glass in my direction. It didn’t do any damage but it did have the happy outcome of a second complimentary glass of champagne for me. Lovely. 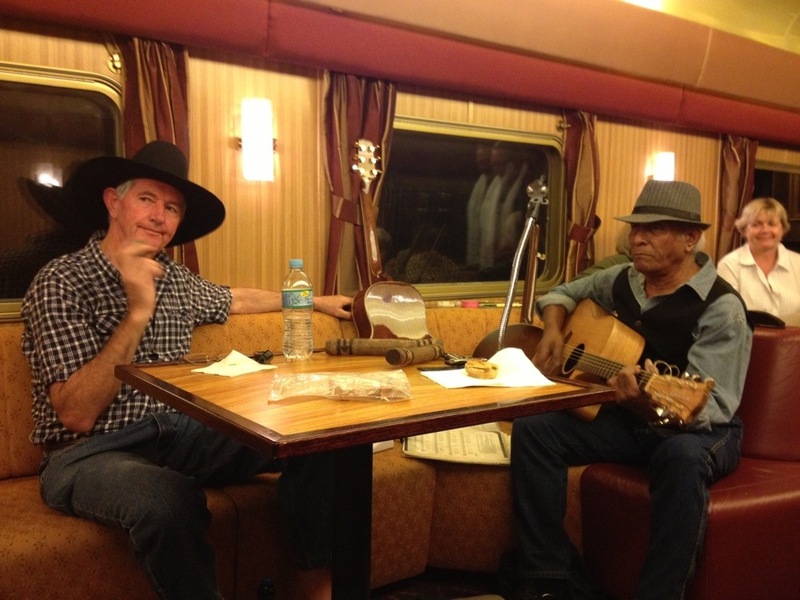 There was entertainment in the Lounge Car after dinner where I had the surreal experience of hearing songs by Bob Dylan, Janis Joplin and Peter, Paul and Mary sung by an Indonesian and an Australian cowboy. They even had one for the lone Canuck in the group…”Here’s one that was recorded by Neil Young and written by Mike Tyson.” Really??? ‘Four Strong Winds’ as it turned out. Who knew?! The champagne is a ruse to keep the guests out of the way while beds are turned down, and after a pretty busy day I confess to being quite ready to tuck in by nine. While I’d heard grumbling about the movement of the train interfering with sleep (I wondered then why they wouldn’t have just flown to Alice) I could hardly wait. 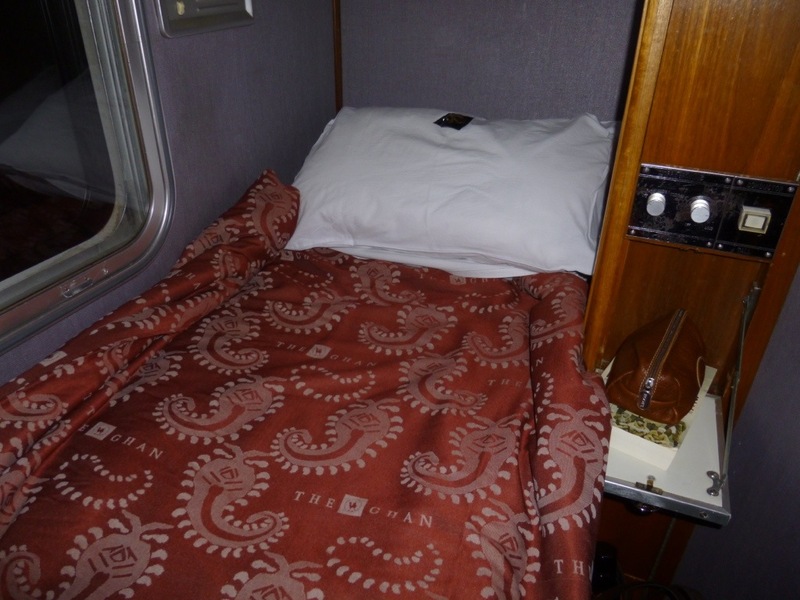 I adore sleeping on a train. I feel like I’m in a cocoon and the swaying of the train is like being rocked to sleep. And so I was, but not before laying for awhile in my PJ’s watching the world sail past my window. Morning brought a high point of my journey with a soft tap on the door at six. My wake up call. And what a wake up call it was, when the attractive young attendant I’d photographed in the station the day before poked his head around the door with my wake up cup of coffee! Now that’s a wake up call. I could absolutely get used to that. 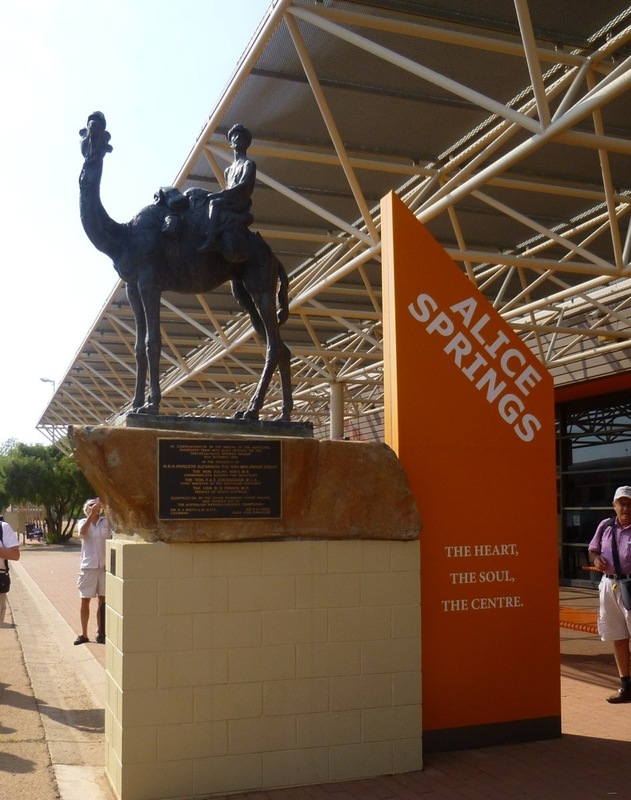 There was time for breakfast and a last visit before arriving in Alice Springs. Eddy dropped by my place, and Fee gave me her address with a lovely invitation to come stay if I wanted to. My gosh these Aussies are welcoming. I was squished in a teary hug by Biv, who also tattooed my cheek with a big pink kiss as she blurted out an invitation to come and stay. I felt like I must be some kind of curiosity to these folks. I couldn’t figure out whether the women, in particular envied my free-wheeling sense of adventure or whether they felt I needed some common sense so were compelled to take me under their wing, alone as I was. Either way it was all very nice, it made me feel warm all over and who knows? I might even stop by. 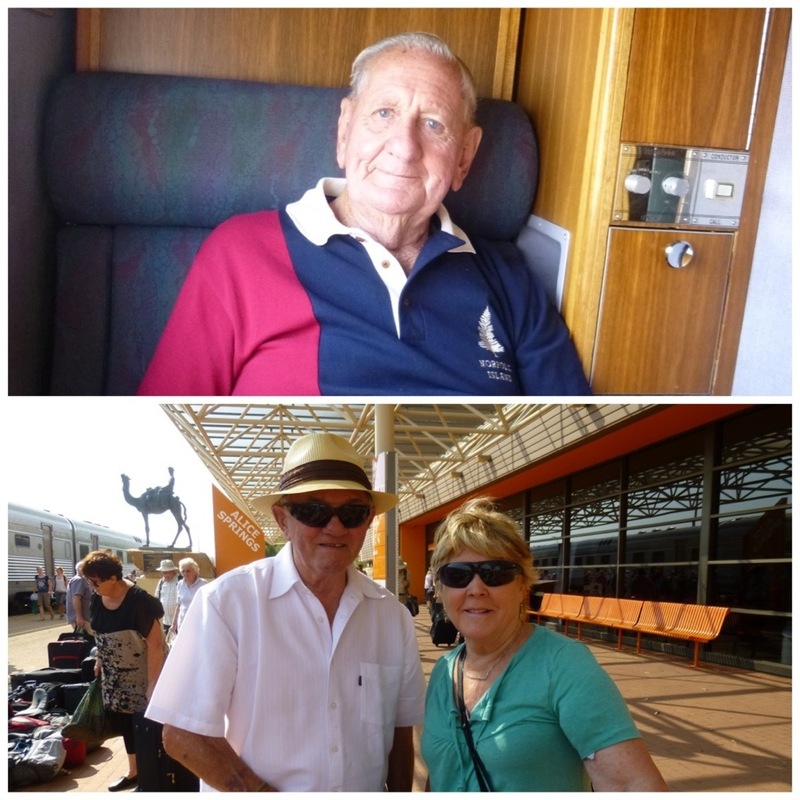 I had heard folks talk about the trip on The Ghan as ‘miles and miles of the same view’ and ‘boring’. Well. I could not stop looking out the window at the constantly changing landscape and the many wonders of the huge desert. Looking like a fabulous trip! I feel like we’re right there with you and I love it!! You have a gift of transporting the reader:) so fun to read!